Let me begin this by saying my dentist is wonderful! I say that from the perspective of one who suffered much at the hands of dentists who thought anesthesia and pain medications should be administered very sparingly. My dentist now, though, takes every possible measure to ensure I am as comfortable as possible while under her care and her employees seem to share her kind and sympathetic heart. Once when I was in the dentist chair to have a cavity filled, my dentist was preparing to inject the area with a local anesthetic agent so I would be numb for the procedure. She had already placed a swab with numbing medication along the spot where the shot would be given, to minimize even the pain of the injection. As the dentist injected the medication, which burns significantly before it numbs, the assistant was gently rubbing a spot on my upper shoulder. It was a soft, gentle touch and it communicated volumes. It communicated care and concern. It communicated empathy for what I was feeling. It communicated a desire to make the situation better and a determination to act on that desire. It communicated comfort. From a physical standpoint, it activated what is called "gate-control." The gate-control theory, first proposed in 1965 by Ronald Melzack and Patrick Wall, asserts that non-painful stimuli (touch, smell, taste, sight, sound) act to interfere with pain sensations from traveling to the central nervous system. Whether this is true or not, I know that when the assistant gently rubbed my shoulder, I concentrated more on the warmth of her touch than on the pain in my mouth. I felt comforted. It was such a little thing, this touch, yet I have remembered it years later so positively. It took little effort on her part and it imparted much comfort to me in receiving it. And in some way, it was from God. so our consolation also aboundeth by Christ." Our God is the "God of all comfort;" any comfort, any mercy, any empathy in some way finds it source in Him. And He comforts us not only because He loves us as His dear children, but so we will be able to comfort others "by the comfort wherewith we ourselves are comforted of God." May I often remember that gentle stroke -- how little it was and what a big impact it had -- as I go about my day, and may I be aware and willing to let that same comfort flow from me to others. A joy for those in sorrow's way. A certain hope for a brighter day. And may the love of Christ redeem my world. May the Light of Christ illuminate my world. May the life of Christ give meaning to my world, to my world. That ever heart may rejoice in song. May living waters flow pure and sweet. See in my face Your love, Your grace and Your mercy. To my world, to my world, to my world. May I be a light. When I was in high school I rode the bus to school all but my senior year. I was the last student to be picked up before reaching the school about three miles from my house. Upon entering the bus, all the seats would be full and many would already have three students on them. Occasionally, someone would scrunch over to make room for me to sort of half-sit on the seat, but more often, no one would budge. A few seconds after the bus doors closed the driver would yell at me to sit down. When there was no room for me to sit, sometimes I would just squat down in the aisle near a seat in the back to make it look as if I was sitting. There was no room for me. How wonderful to know there is a place with room for everyone who comes. Even "though millions have come," as the old song says, "there is still room for one." In fact, there is room for all! "For God so loved the world that He gave His only begotten Son that whosoever believeth on Him should not perish, but have everlasting life." At the cross of our Lord Jesus Christ there is room for all, there is room for one, there is room for me! No one who comes with a sincere and honest heart will ever be turned away. And welcomes a sinner before it's too late. Yes, there's room at the cross for you. The blood flows from Calvary to cleanse every stain. If you recognize the name Elwood P. Dowd you have undoubtedly seen the movie or play, "Harvey." The play was written by screenwriter May Coyle Chase and in 1945 won the Pulitzer Prize for Drama. It was adapted for the movie by Oscar Brodney and Myles Connolly. 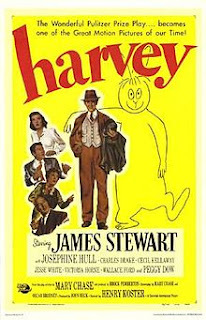 Jimmy Stewart played the lead role of Elwood P. Dowd, a middle-aged, amiable and eccentric man whose best friend is an invisible six-foot tall rabbit named Harvey. According to Elwood, Harvey is a "pooka," a creature from Celtic mythology who is fond of social outcasts. Since no one else can see Harvey, his family isn't sure if Elwood's obsession with Harvey is a product of his propensity to drink or maybe a mental illness. "Years ago my mother used to say to me, she'd say, 'In this world, Elwood, you must be' --she always called me Elwood -- 'In this world, Elwood, you must be oh so smart or oh so pleasant.' Well, for years I was smart. I recommend pleasant. You may quote me." To me, this is a great statement. Now, I realize there are many people who are both smart and pleasant. . .my husband is a wonderful example of such a combination. But aren't we all tempted to be less than pleasant sometimes? We each have a choice as to how we respond to situations, places and especially people around us. How we are perceived speaks great volumes about what is inside of us. It is often so easy, so tempting, to be gruff or irritable, or even flat with hardly any affect at all. It takes a bit more to be kind and pleasant. For Christians what it takes a bit more of is faith. Faith that the One who is infinitely kind and exquisitely pleasant lives right inside of us. It is faith that leads us to the choice to "let this mind be in you which was also in Christ Jesus." It is faith which leads us to the choice to care about others, about what they care about and to, as Harvey would say, "prefer them." One of the questions we ask pregnant women as we admit them to Labor and Delivery is, "Do you want to do skin-to-skin when the baby is born?" Most of our pregnant women are familiar with term as they have either heard of it from their physician or they have learned it in their childbirth classes. For most women the answer is an enthusiastic "Yes!" Skin-to-skin is the practice of putting the bare baby on the mother's bare chest, covering them both with a warm blanket and allowing no interruptions for at least an hour. Studies abound which show multiple benefits to both mother and baby for this practice. Newborns regulate their temperature better when in direct contact with mother's skin. Breastfeeding is established easier, the baby's blood sugar is better regulated, the baby stays calm and breathes more naturally. For the mother there is less incidence of both engorgement and postpartum depression. Skin to skin contact can be done even in the process of a Cesarean birth, and if fact, many of our babies born by Cesarean Section ride back from the operating room still on the mother's chest. The same is true of us with our spiritual Father. The more we are in close contact with our Heavenly Father, the more we will be in tune with His ways, His Word and His eternal purpose in Christ Jesus. The more we are in-tune with Him, the more peaceful and joyful we will find ourselves. But unlike the baby, who depends upon others to place him or her in contact with the mother, we much willingly seek out contact with our Heavenly Father. We must seek Him in His Word and in prayer. And our Heavenly Father is no less enthusiastic about contact with us than are earthly mothers. He desires us to seek Him, He longs to spend time with His children and He wants to be intimately involved in every aspect of our lives. Whenever we watch a new mother lovingly care for her newborn we can know without a doubt that this is but a shadow of the love and care the Lord has for us. ". . .but the prayer of the upright is His delight." When our children were small I tried to impress upon them that the best way to tell someone they loved them was not with the three little words, "I love you," but with the four little words, "How can I help?" Love that is not active can never be true love. True love seeks to bless, to encourage, to strengthen and to help others. If a person can sit by and watch others work hard, and never even offer to help, that portrays a great deal of self-absorption and lack of true love to others. The love the Lord has for us is very active, not passive. He worked in paying the penalty for our sins, He works in us to will and to do of His good pleasure, He works to ever make "intercession for us." True love and caring produces actions. There is not a person in this world whom the Lord does not love. That is one reason why we so often close our chapel services with the song, "Jesus Loves Me." Every tongue can sing that song truthfully, because He does indeed love everyone. Remembering this, let us choose to live our lives with love toward everyone we encounter. This means we will be kind and patient with them. It means we will not envy something they have which we don't. It means we won't be proud or arrogant. It means we will behave in a way which will glorify the Lord Jesus Christ. It means we will not look toward what we want, but will rather seek to satisfy the needs of others. It means we will not be happy when evil things happen, but will have joy in the Lord. It means we will peaceably be a burden-bearer. We will be those who encourage others, we will offer hope and we will do so with all patience. May we be active in our love and may that love spread to everyone whom the Lord places in our paths. Everyone at some point experiences pain. If we are not currently in pain, we undoubtedly know someone who is. If we do not personally know someone in pain, we know that someone somewhere is currently in pain. Pain is such a complex thing and often hard to define. Pain can be throbbing, stabbing, sharp, dull, squeezing, radiating, and more. Regardless of the particular definition we use to define it, we know one thing for sure, pain hurts. Pain also protects. The pain we feel as our hand gets too near the stove protects us from further damage. The pain from an injury keeps us from continuing on, which could cause more damage, and leads us to seek rest and treatment. Pain can strengthen. Ask any weight lifter why they suffer through sometimes painful workouts and they will tell you the minute muscle damage increases strength as the muscle repairs itself. It reminds me of when our son was in Marine Corps basic training we came across a Marine Corps poster which said, "Pain is weakness leaving the body." Pain can lead to wisdom. When we hiked our first section hike of the Appalachian Trail, we underestimated the trail and over-estimated our abilities to deal with the unexpected. Because of that, and for reasons outside of our control, we experienced some painful situations. That particular pain caused us to plan more carefully the next time. The experience also taught us we can do much more than we thought we could. Pain can be a great motivator. It motivates us to remove ourselves from whatever is causing the pain, or to remove the source of the pain from ourselves. It motivates us to do those things which will keep the pain from recurring. Pain also leads, it leads us to a choice. We can either concentrate on ourselves, our pain and our situation or we can choose to direct our thoughts toward others. So we are back where we started. . .we all either know someone who is hurting or we know that someone somewhere is hurting. Praying for others when we find ourselves in pain is not an easy thing to do, yet it follows the pattern the Lord Jesus Christ gave us. As He was nailed to the cross, He prayed for the Father's forgiveness for others. Praying for others, instead of focusing on ourselves, gives more purpose to our pain. Indeed, in our easily distracted world, it may be pain is one of the ways we can become focused on the needs and pains of others. It is always sad when the day comes to take down the Christmas tree. 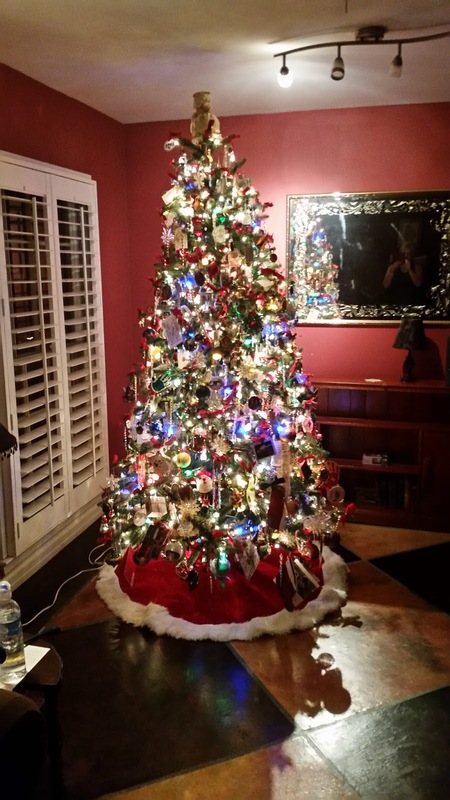 I love the light and sparkle of the tree, I love the beauty and feeling of celebration it imparts to the house. But Christmas trees need maintenance and ours has reached that point. Several years ago, due to my allergy to trees, we purchased a pre-lit artificial tree. It was and still is beautiful. Over the years some of the colored lights had blown out and needed to be replaced. Some of the white lights too had gone dark. I used a handy light-repair gun to bring them back to life a few times, but now they are dark for good. In an effort to get the tree decorated on time, I added new white lights, but left the malfunctioning ones on the tree. I simply covered the problem, I didn't resolve it. Now the time has come to strip the tree of all its lights and restring it. I confess, I am not looking forward to this project, but I know better than to just wait until the end of the year to do it. Then I will be ready to get the tree up and won't want to take the time and effort to remove the lights. It isn't enough to just cover the broken lights, they need to be replaced. I must remove the ones which came on the tree and wind new ones along the branches. When finished the tree will be bright and shining again with no traces of the previous brokenness. The tree reminds me of ourselves before we come to know the Lord Jesus Christ as our Savior. We are as dark as my Christmas lights. Sometimes we try to hide that darkness by putting good lights, good deeds, good thoughts along with the dark, but we are still dark. When we believe on the Lord by faith, He doesn't just cover up our sins, He washes them clean. He not only washes away our sins, but the Bible says that in some marvelous way I don't think I will ever understand, He has removed our sins "as far as the east is from the west," and indeed He says He remembers them no more. ". . . for I will forgive their iniquity, and I will remember their sins no more." Jeremiah 31:34. May we keep in mind here at the beginning of this new year, and indeed, all year through, that our sins are washed away, our sins are removed as far as the east is from the west, because they were laid upon the Lord Jesus. January 1st is traditionally a time for new beginnings, resolutions and hopes for improvement. In fact, after leaving the gym the other day we remarked how crowded it will likely be in the coming weeks. Then it will gradually slow down to those who have been working out most of the previous year. In our Christian lives we may often find ourselves in a place where we appear to have less fervor, less zeal than we did before. We may find that we have let sin easily beset us or that we have fallen far from "that good, and acceptable, and perfect, will of God." This may lead us to feel as if we must somehow straighten ourselves up before we can re-establish our fellowship with God. Indeed, we may feel that there is no hope, that we will always be this way, and we will be sorely tempted to just wallow in the mud of disappointment and despair. There are two truths we must confess and affirm, even if we don't feel as if they are true, if we are to ever live a Christian life of victory. First of all we must realize we can no more "clean ourselves up" to restore our fellowship with the Lord than we could to procure our salvation. His is the work of transformation and His alone. The work of our flesh in trying to make ourselves acceptable to the Lord is "as filthy rags" even when it is the Christian doing so. The Lord has provided an advocate for us in the form of His Son, who is our perfect and better High Priest. The blood of our Lord Jesus Christ, which was shed for our sins, was shed not just for the sins of our past, but for every sin of every person at any time. Secondly, we must realize when we fall it is our Father's desire that we avail ourselves of His forgiveness and return to a life of righteousness. We so often can hear the shouting of our enemy telling us we should just lie there in our failure, that we do not hear the still, small voice of the Holy Spirit encouraging us to "Get Up!" Every time we fall it is an opportunity for a new beginning, a chance to get up and press on. The Lord doesn't want us to dwell in failure, but to dwell in His abundance grace and mercy, to know His love and the live in His peace. So if you find yourself in the slough of despond, "Get up!" If you find yourself en-robed in the guilt of sin, admit your sin to the Lord, cast off the paralyzing guilt and realize He has wrapped you in the glorious righteousness of Christ and know without a doubt that we have a God who delights in mercy. that pardoneth inquity, and passeth by the transgression of the remnant of His heritage? because He delighteth in mercy."